Pope Francis held a historic public mass for an estimated 170,000 Catholics at a stadium in the capital of the United Arab Emirates on Tuesday, capping the first ever papal visit to the Gulf where Islam was born. The pope's public comments in Abu Dhabi centred on calls to end wars across the Middle East and protect the rights of all citizens. "It is most certainly not easy for you to live far from home, missing the affection of your loved ones, and perhaps also feeling uncertainty about the future," the pope said. Aboard the papal plane on his way back to Rome, he hailed the visit as a "step forward" in dialogue with Islam, a relationship that must still "ripen like fruit". Asian nationals make up some 65 percent of the population and are crucial to all sectors in the oil-rich Gulf state, from construction to services and hotels. Inside the stadium on Tuesday, 50,000 Catholics with tickets to the mass cheered the pope on, with one small group hoisting a pink posterboard which read: "We the Catholics of Yemen love you". Another 120,000 gathered outside, watching via video link on large screens. Parishes across the UAE said 135,000 tickets to the pope's mass were distributed to parishioners. Some 4,000 tickets had been given to Muslims to attend the mass, according to the local churches. 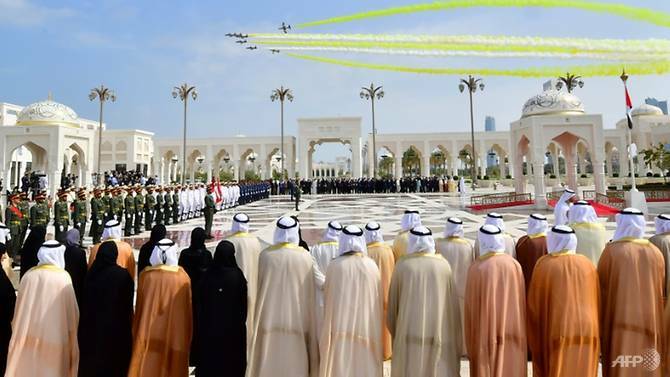 A choir sang hymns as the pope, joined by priests of different nationalities, began the service at around 10:30 am (0630 GMT), broadcast live on Emirati television. The UAE invited the pope to visit as part of its 2019 "Year of Tolerance" which has its own designated ministry. Tolerance Minister Sheikh Nahyan bin Mubarak greeted the crowd at the stadium. On Monday, the pope called for an end to wars in the turbulent Middle East, including in Yemen and Syria, at a meeting with a top sheikh and rabbi in the UAE. All religious leaders had a "duty to reject every nuance of approval from the word war", he told the interfaith meeting. Yemen is in the grip of what the UN calls the world's worst humanitarian crisis, triggered by the intervention of Saudi Arabia, the UAE and their allies in a civil war between the government and Shiite Muslim rebels. While the pope did not openly discuss politics, he called for "the full recognition" of the rights of people across the Middle East, a potential reference to Christian minorities and communities including Shiites in Saudi Arabia, refugees, migrants and stateless peoples. At their meeting Monday, the pope and Sheikh Ahmed al-Tayeb, the imam of Cairo's Al-Azhar, Sunni Islam's prestigious seat of learning, signed a document on "human fraternity for world peace", hailed by the Vatican as an "important step forward in the dialogue between Christians and Muslims". Late Tuesday, Abu Dhabi Crown Prince Sheikh Mohammed bin Zayed Al-Nahyan said he had "ordered the construction of the Abrahamic Family House in Abu Dhabi to commemorate the historic visit" of the two religious leaders.